Listed in 1900 Census for Douglas Co. OR, age 44, Farmer, single. Father was born in Illinois, and mother in Ireland. (or Merril) see siblings - various spellings. - living in Sebring, FL in 2000 & April 2001. + Dorotha K. (Dorotha had a brother Harold RUSHER) and 3 sons with the surname CUMMINS. Published in The Elkhart Truth. daughter of John M. and Clara M. Gibbs Tarbet. another source Sandusky Co. OH 11-4N 15 E and 20-4N 16E for the 12th, and 34-4N-16E on the 24th of April. "Principal Delaware"
I believe this to be in Sandusky County Ohio. All three parcels are in 4N township. Children: All born in Ohio: Joshua (b. 1810), Rebecca (b. 1811) Emanuel (b. 1812) , David (b. 1814), Ruth (b. 1815), John (b.1816), Mary, (1817), Elizabeth (b. 1819), Nicholas (b. 1821), Joseph (b. 1823) and Elisha (b. 1825). "Thomas moved around in OH between Pickaway and Fairfield Counties. After Eleanor died he settled in Ross Co." Per Shirley Nice Schuldt a descendant of Thomas Correspondance 2/19/1999. Source: Volume A Record of Deeds" Marriage Licenses from the Recorders office of Fairfield, OH LDS film 0295268, donated by Shirley Schuldt. also in Richland Parish is a James. Same general area. Children lived with their mother in West Fargo ND. Orrin and Mercy were divorced when Thomas was an infant. Mercy then married Thomas A. Hartley. Thomas J. is living with his mother and step-father in the 1930 census when he was 19.
d. 22 December 1993, Cemetery Records at St. Paul Cemetery, Wells Co. IN year born 1910, age 83. + Mary Charolette FINLEY July 1936. I believe Thomas remarried. b. Jan. 29, 1916 daughter of Herman E. and Anna C. (BRANDT) FINLEY. She was probably born in Huntington, IN. Mary's siblings were Anna Mae-Mrs. Russell D. Richardson b. 1918, Mrs. Garnet Reifert, Mrs. Betty Fox, Ralph Finley, William Finley, and Russell Finley, all who preceeded her in death. 1930 census lists 19 year old Thomas in Huntington Co. IN. Thank you Virgina and Carrie 7 sons: JD, ED, RD, PD and DD (brothers from Wells Co. IN - living) and John Eldon (1937-2001) JD. 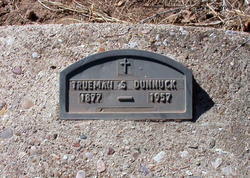 Children's names - also in obit of John E.
William E. DUNNUCK b. 10 June 1942, d. 11 July 2006 of Merkle, IN -Known as "ED" - two brothers were deceased. John E. and Robert. Mary's obit also publ. in the New Banner (probably Bluffton News Banner) page 3, col. 1.
b. 10 Oct. 1857 - Jansen source Is this the same person??? Middle Initial is "A." in Census, and "M." in the Shallenberger Linage by Jansen. Son of Emanuel and Sarah Landis DUNNICK, but don't have proof. Can anyone help??? + Sarah b. ca 1854 *age 26 in 1880 Census for Amanda Twp, Fairfield Co. OH. d. Sarah is living in 1910. Clyde was living with Sarah E. in Lancaster, Fairfield Co. Ohio in 1910 age ca 28, and also in Lancaster City in 1924/25, age about 42. He does not appear to be married. Ancestry.com (page 260 of index) Ohio. Division of Vital Statistics. Death Certificates and index, December 20, 1908-December 31, 1953. State Archives Series 3094. Ohio Historical Society, Ohio. b. May 1830 (age 20 in the 1850 OH census) /Joshua deceased/ Thomas living with Benjaman Tallman DUNNUCK and his wife Minerva Ashbrook who are both about 31 yrs old. m .#1 Ruth BOWMAN 1 Oct. 1854 in Pickaway Co. OH. d/o John & Ruth BOWMAN of Walnut Twp. Pickaway Co. OH. d. Sept. 12, 1876 - age 45 of T.B. series M654, roll 1023, part 1, page 89B. 1870 census Walnut twp, Pickaway Co. OH series M593, Roll 1256, part 1, page 532A - lists: Thomas age 40, Farmer, Ruth 35, Milton age 14 working on farm, and Alma B. age 6. 1880 census Walnut twp., Pickaway Co. OH, Thomas 50 farmer b. OH, daughter Alma age 16, Grace age 7, and Jesse Baringer, age 20 Alma's husband. married about 1884 (she is listed as his wife in the 1900 census for Harrison Twp, Pickaway Co. OH) They had been married 16 years. Ellen lists that she had 4 children, and one was living. Seems if she had any with Thomas they would still be living at home. Only a granddaughter of one of them, 4 year old Heulda Graffis with them. Check -- Ellen DUNNICK who was born "about 1836", daughter of William & Mary (Hoover) CLOUD. She died 19 Feb. 1909 at Muhlenberg, Pickaway, Ohio. Source: 1850 Ohio Census // OH Marriage index // Biographical on Joshua DUNNICK, History of Franklin & Pickaway Counties in OH. Publ. by Williams Bros, 1880, Page 282. contributed by Susan Couch. History of Pickaway County and Representative Citizens by Van Cleaf, Publ Biographical Publ Co., Chicago, 1906, page 240 Contributed by Roland and Karla Steward. d. between 1889 and 1891. Carrie and John listed in the KC MO city directories, and during that same time frame Carrie is listed as the widow of Thomas. the address listing for her as a widow is the same address as that of Claude, 13114 Holmes. no known children -- Claude b. ca 1869 & Maude b. 1868 were by Andrew St. John. (May have been adopted - went by Dunnuck. 1870 census for Centropolis, Franklin Co. KS lists Andrew St. John age 35 Farmer b. NY, and Carrie age 29 b. IN. Maude 2 and Claude 1 born in KS. 1900 Census for Centropolis Twp, Franklin Co. KS. Thomas living with sister Jane E. (Mrs. Michael Stoll) He is 59, and listed as "Dv" divorced. 1905 Census for Welda, Anderson Co., KS. Thomas J. living with sister sister and her husband JM & EJ STOLL. 1910 census for Welda twp., Anderson Co. KS Thomas J. living sister Elizabeth Jane and husband John M.Stoll. listed as Widower. m. Mary Jerline "Jerline" HARDIN 21 Jun 1958 Caswell, N.C. (Elon College) (I believe it is Mary Jearline) Mother's obit calls her Jearline. Source: numerous places on line - Obit Times-News.freedom.com & HardinGenealogy@aol.com // correction by "C. Dunnuck"
Taxi permit granted to Thomas Oliver in May 1965 Burlington N.C. Graduated Technical Institute in Auto Mechanics in August 1965, Burlington, NC. b. Nov. 8, 1877 at Mechanicsburg, IL, per his obit. consistant with 1880 and 1930-census. d. November 2, 1957, age 79 at Abrham Lincoln Memorial Hospital. (Lincoln, IL) His body will be sent to Flagstaff, AZ for burial Source: Illinois State Journal Nov. 3, 1957, page 42. - burial in the Citizens Cemetery , Flagstaff, AZ on Nov. 7. Services were Monday Nov. 4 clipping - paper unknown. Lula was the daughter of Henry and Matilda (MEIER) RUNTE. Henry was born September 20, 1849 and died August 1903. Matilda was his first wife. She was born in 1852 at Eppleyanna, Rock Run Twp., Davis, Stephenson, Illinois and died in August 4, 1887, buried in Iowa. Henry's second wife was Mary Mills. Mary was born in 1860 and married Henry December 11, 1888 in Atlanta, IA. 1930 Census Winona, Coconino Co. AZ. Lula was 48. They married about 1903. His obit lists his living siblings, but no children. b. 5 Nov. 1894, Flagstaff, Coconio, AZ (wonder if this is the date of his enlistment) His obit did not list children, only siblings. Check out T.F. DUNNUCK at top of page.